Johannes Zukertort Johannes Hermann Zukertort (SOOK-er-tort) was born in Lublin, Congress Poland (then an occupied country by Tsarist Russia) on September 7, 1842. His original name was Jan Herman Cukiertort. His mother was the Baroness Krzyzanovska. His father, Yenkel Ezekiel Cukiertort (1801-1887) was a Christian Protestant (Lutheran) missionary. He worked for the 'London Society' to convert Polish Jews into Polish Christians. Both parents were Polish. Zukertort had a younger brother, Adolf, who had 2 sons (Johannes's nephews) that were German generals during World War II. The Tsarist-occupying regime had closed most Polish schools and banned the Polish language in administrative service, insisting on using the Russian language. Jewish peasants were forced to speak exclusively Russian and many were converted to Orthodox Christianity (Russian speaking) rather than Roman Catholic or Lutheran Christianity (Polish speaking). In the 1840s, the family moved from Russian Poland to Warsaw, Prussia, 100 miles northwest of Lublin, in a missionary house of the 'London Society.' There, they could practice and use their Polish language. In the summer of 1850, the family moved to Piotrkow Trybunalski (Petrikau), near Lodz, Poland, about 75 miles southwest. He attended the Piotrkow School until he was 13. In February 1855, the family had to leave Russian territory. The 'London Society' was banned and accused of being a front for espionage. This Polish Christian mission was not approved by the Russian Tsarist occupying administration (due to the fact that Tsarist regime wanted Jews to learn to speak Russian – rather than Polish - and to be converted into Orthodox Christianity, rather than into Roman Catholicism or Lutheran), and therefore the Zukertort family was expelled in 1855 out of Poland by the occupying Tsarist regime. The family moved to Breslau (present day Wroclaw), in western Poland, home of Adolf Anderssen. The family changed their name from the Polish version Cukiertort to the German version of Zukertort. Zukertort attended a local grammar school in Breslau, the Mary Magdalen Gymnasium. Zukertort learned to play chess from his father in Breslau around 1858, when he was 16. He bought his first chess set at a fair. In 1861, at the age of 19, he joined the 'Akademischer Schachklub' in Breslau. He entered a local tournament in Breslau, but lost every game. He later became a student of Adolf Anderssen. He also took up the study of Bilguer's Handbuch to improve his chess openings. In 1861, he enrolled at the University of Breslau to study medicine. Zukertort claimed he obtained his medical degree at the University of Breslau in 1865 or 1866. While at the university, he became a member of the Slavic Literature Culture Society, which was a club for Polish students at Breslau University who left Russian-occupied Poland. He studied chemistry, physiology, philology, and theology with distinction. In 1862, Zukertort was considered the second best player in Breslau, after Adolf Anderssen. Zukertort wrote that he had played thousands of chess games against Anderssen and gained much experience. In 1863, his fiancee died during the 1863 Polish Uprising against the Tsarist Russians. In 1864, Zukertort was giving blindfold chess exhibitions to popularize chess. He gave a 3-board blindfold exhibition on Poznan, Prussia (now part of west-central Poland). In 1866, he obtained German citizenship. In 1866, during the Austro-Prussian War, he was active in the Prussian medical corps. In 1867, Zukertort was struck from the list of students on account of poor attendance. He left the university without taking either intermediate or final exams, and was not licensed to practice medicine. He was not a medical doctor. In 1867, he moved to Berlin and became co-editor of the Neue Berliner Schachzeitung with Adolf Anderssen. Zukertort remained editor until 1871. In 1868, he lost to Adolf Anderssen (1818-1879) in a match in Berlin, with 3 wins, 8 losses, and 1 draw. In 1868, Zukertort gave a 9-board blindfold exhibition in Berlin. 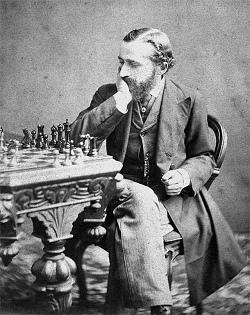 In 1869, Zukertort got into a dispute with chess composer Johannes Minckwitz, a chess publicist. Minckwitz, in his Leipziger Scachzeitung chess magazine, published a negative review of a collection of chess problems published by Zukertort. The dispute was carried out in several issues of Zukertort's magazine and Minckwitz's magazine. In 1870-71, he was active in the medical corps during the Franco-Prussian war. In 1871, he beat Adolf Anderssen in a match with 5 wins, 2 losses, and no draws. In 1871, Zukertort worked on a tournament book for the West German Chess Congress held in Krefeld. In 1871, the publication of Zukertort's Neue Berliner Schachzeitung ended by its publisher, J. Springer, which was the source of his main income. In 1872, he moved to London after being offered 20 guineas travel expenses by some English patrons. The patrons hoped that Zukertort would be the main rival of the less-popular Wilhelm Steinitz. He was invited to join the St. George's Chess Club in London. Zukertort lived at 187 Walworth Road, London. In 1872, played in a London tournament. He came in 3rd, behind Wilhelm Steinitz and Joseph Blackburne. In 1872, he lost to Steinitz in a match with 1 win, 7 losses, and 4 draws. The stakes was 20 pounds for the winner and 10 pounds for the loser. In 1872, in an account of his life for the Norfolk News in East Anglia, England, Zukertort claimed aristocratic descent, fluent in 9 languages, fought in numerous battles, and that he got a medical degree from Breslau. In 1873, Zukertort published a series of chess articles in the Westminster Papers and also wrote for the City of London Chess Magazine. In 1873, he demonstrated his blindfold chess skills by playing 6 games blindfolded simultaneously during the first Oxford University vs. Cambridge University chess match. In 1876, he took 2nd in a London tournament. On December 16, 1876, he played 16 simultaneous blindfold games in London (St. George's Chess Club), winning 12, drawing 3, and losing only 1 game. It was a new world record for simultaneous blindfold games. The records stood for 24 years, until Pillsbury equaled then exceeded the number of simultaneous blindfold games in 1900 to as many as 20 simultaneous blindfold games. In 1877, he took 1st at Cologne and 2nd at Leipzig. In 1878, he became a naturalized citizen of the United Kingdom. In June-July 1878, he tied for 1st at the Paris International Chess Congress with Winawer and beat Winawer in the play-off. Zukertort won 1,000 francs and was given two Sevres vases, worth 5,800 francs each, by the President of France. He sold those three days later at a pawn shop for half the value. In January 1879, Zukertort started playing and teaching Lord Randolph Churchill. In 1879, he was co-editor, with Leopold Hoffer, of The Chess Monthly. The two collaborated on the magazine until 1888. In 1880, he won a match in London against Rosenthal with 7 wins, 1 loss, and 11 draws. In 1881, he was 2nd at Berlin, behind Blackburne. He then beat Blackburne in a match in London with 7 wins, 2 losses, and 5 draws. In 1882, he tied for 4th at Vienna. In April-June 1883, he took 1st place at London (played at Victoria Hall), 3 points ahead of Steinitz, scoring 22.5 out of 29. His performance rating for this event was 2844. He could have done even better, as he lost his last three games, attributed by some to the use of drugs to deal with the pressure. After this tournament, Zukertort was widely regarded as the unofficial World Chess Champion. On October 20, 1883, Zukertort left England for and extended tour of the North American continent. He wanted to bring his name to the public in an attempt to secure backers for a world championship match between him and Steinitz. Zukertort gave simultaneous and blindfold exhibitions for $100 each. In April-May 1884, Zukertort visited New Orleans, but there is no record that he met with Paul Morphy, who died in New Orleans on July 10, 1884. In December 1884, the Zukertort Amstelveen Chess Club was organized in the Netherlands. In March 1885, Zukertort listed his conditions of a world championship match with Steintiz, which appeared in The Chess Monthly. In 1885, Steinitz and Zukertort agreed to play an official world championship chess match. The first to achieve 10 wins, draws not counting, would be recognized as the world chess champion. Steinitz was living in Brooklyn at the time and Zukertort was living in London. (see my article on Steinitz for more detail). The match was held in New York for the first 5 games. The match then moved to St. Louis for the next 4 games. The final 11 games were held at the New Orleans Chess, Checker, and Whist Club in New Orleans. The match started on January 11, 1886, with Steinitz winning the first game. Steinitz wanted the U.S. flag to be placed next to him during the match, even though he still was an Austrian citizen (he became an American citizen almost three years later). Less than 40 people were present at the start of this historical match, despite Steinitz's daughter, Flora, selling programs and photographs to earn a few extra dollars for the family. Steinitz couldn't even afford a winter coat for her daughter. The New York site was at the Cartier's Rooms on Fifth Avenue and sponsored by the Manhattan Chess Club. The time control was 30 moves in 2 hours, with a 2 hour dinner break, then 15 moves an hour. Zukertort won the next 4 games in a row before moving on to the St. Louis Chess, checker, and Whist Club in St. Louis, Missouri. 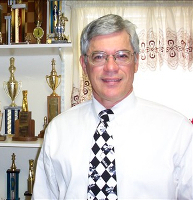 In St. Louis, Steinitz won 3 games, with one game drawing. In New Orleans, Zukertort could only win one game. Steinitz won 6, the rest drawn. Steinitz won the match on March 29, 1886, with 10 wins, 5 losses, and 5 draws and was proclaimed official world chess champion. The match was the first time that a chess demonstration board was used for the audience. The demo board was run by one of America's strongest players, George Mackenzie. The stakes were $4,000 (over $95,000 in today's currency) or $2,000 a side. On March 29, 1886, Steinitz was declared the winner. Zukertort lost with 5 wins, 10 losses, and 5 draws. Steinitz received $1,000 in prize money and $3,000 was paid to those who bet on the winner. Steinitz returned home to New York and Zukertort left for San Francisco. After the match, Zukertort suffered from rheumatism, coronary heart disease, kidney problems, and arteriosclerosis. In 1886, he took 7th in London and 3rd in Nottingham. In 1887, he took 15th at Frankfurt and 4th at London. In 1887, he lost a match against Blackburne with 1 win, 5 losses, and 8 draws. In 1887, his father, Yenkel, died. In 1888, he took 7th at London. Zukertort's last tournament was the summer British Chess Club Handicap Tournament, held at King Street, Covent Garden, London in June-July, 1888. He had chances of winning the tournament and was in 1st place at the time of his death. At the time of his death he had won 7 games, no draws, and 1 loss. The playing committee decided that all his unfinished games would be declared drawn. 6 of his games were drawn and he ended up tied for 3rd place, despite 6 games not played. Blackburne and Gunsberg tied for 1st. On June 19, 1888, Zukertort had a cerebral stroke while playing an off-hand chess game against Sylvain Meyer at the Simpson's Divan coffee house. He was then taken to the British Chess Club, and then to a hospital around 2:30 A.M. He died at 10 A.M. on June 20, 1888 at the Charing Cross Hospital in London. He was 45 years old. His brother, Adolf, a stenographer, also died at age 45. Zukertort was buried in Brompton Cemetery in southwest London on June 26, 1888. Some of the mourners at his burial included Bird, Hoffer, and Gunsberg. Over the years, grass covered his grave, and his grave went undiscovered until March 2011, when it was restored with the help of grandmaster Stuart Conquest and Polish Heritage Society member Marek Stella-Sawicki. His grave was rededicated with a new headstone, donated by the Polish Heritage Society, on June 26, 2012. The rededication of Zukertort's grave was conducted by Rev. Walter Jagucki, Bishop Emeritus of the Lutheran Church in Great Britain, in conjunction with Father Wladyslaw Wyzowacki, Polish Roman Catholic priest. A Zukertort Chess Club in London was organized a few weeks after his death. Zukertort claimed he was fluent in at 14 languages (English, German, French, Spanish, Italian, Latin, Greek, Hebrew, Russian, Sanskrit, Arabic, Turkish, Danish, and Polish). He claimed he fought in several military campaigns for Prussia against Austria, Denmark, and France. He once had been left for dead on the battlefield. He allegedly was decorated for gallantry 9 times. He was a fencer, a world class whist and dominoes player, a pianist, a music critic, swordsman, marksman, editor of a political paper, and on the staff of Bismark's newspaper, the Allgemeine Zeitung. He was a leading spokesman for prison reform. Although he never married, he had two illegitimate daughters, Iseln and Maud. It is said that at a dinner party, with both Steinitz and Zukertort attending, a toast was made to the greatest chess player in the world. Both Steinitz and Zukertort both rose at the same time. Zukertort introduced the move 1.Nf3, which was once known as Zukertort's Opening. In tournament play, Zukertort plyed 465 games and won 267 games (57.42%), drew 78 games (16.77%) and lost 120 games (25.81%).